Against the Falcons, we saw Carson Wentz hand the ball off more times than he threw it for a change. Sometimes, it's the little things that count. The things that don't appear significant in isolation, but when added together and viewed retrospectively, in aggregate, can ultimately be the difference between winning and losing. 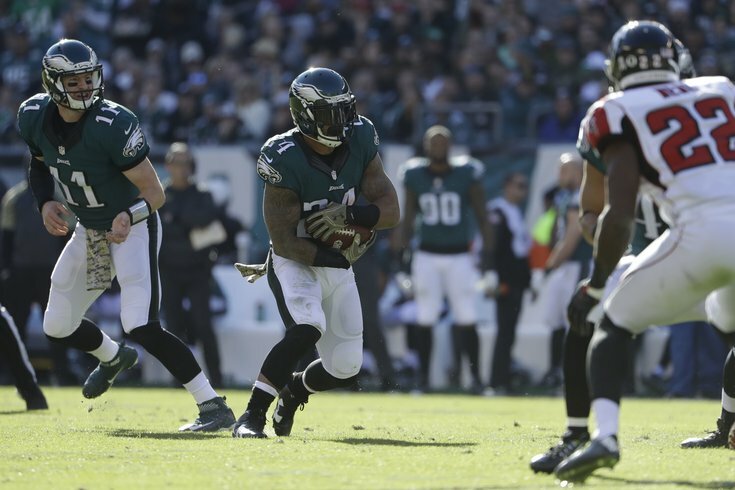 In the Eagles' 24-15 win over the Atlanta Falcons on Sunday, that number was 6.36. As in 6.36 yards per play on first down. "The biggest thing coming out of this game, as opposed to some of those other games, was we did a little better on first and second down yesterday than we did in those previous games where we kept ourselves in some third-and-longer situations," Eagles coach Doug Pederson said Monday. "At least we were in some manageable down-and-distances there that gave us opportunities to stay on the field." In all the Eagles ran 36 first-down plays. Of those, 20 went for at least five yards -- and nine went for 10 or more yards. Furthermore, only five were for no gain and just one went for negative yards. That carried over to shorter second downs and, ultimately, much more manageable third-down situations. "And then just our offensive line taking control at the line of scrimmage and playing on their side of the ball was a big benefit and [we] didn't have to necessarily have to throw the ball as much," Pederson added. "Our running game obviously was kind of taken over and wanted to continue that late in the game." He somewhat rushed through those things -- winning at the line of scrimmage, running successfully, limiting rookie Carson Wentz's throws, and, in turn, dominating the time of possession -- but they all played an important role in not only beating the Falcons but also being able to hold their high-powered offense to a season-low 15 points, well below their average of over 33 points per game. It's why the Eagles were able to run 28 more plays than Atlanta and out-gain the Falcons by 125 yards. And unlike against the New York Giants a week ago -- when the Eagles found themselves down 14 points almost immediately -- or even Dallas a week earlier, Pederson was able to stick to a more balanced gameplan. Of course, another part of the why the Eagles relied so heavily on their ground game was because of how successful they were at it, finishing with 208 yards rushing (5.5 YPC). "I think it's definitely a blueprint to winning games in the NFL," Pederson said. "Any time you can rush the ball like that, it does, speaking from experience, it alleviates the pressure to always have to make that throw or that catch and you stay manageable. "First and second down is so important to your success on third down, and we were able to do that yesterday. You know, 36 percent, I think on third down. I would like to have one more third down and you're even better. But, that running game is so important." And all of that is important to your defense, because it keeps the opposing offense off the field. The Eagles out-possessed Atlanta by a whopping 16 minutes and 20 seconds (38:10 to 21:50), which limited the Falcons to just 48 offensive plays. They were also able to hold Matt Ryan and the rest of their offense to 303 yards, just 255 of which came through the air. • 76-yard TD pass to Taylor Gabriel. • 29-yard pass to Julio Jones. • 28-yard pass to Jones. • 20-yard pass to Jones. On their other 44 offensive plays, the Falcons gained just 150 yards -- or 3.4 yards per play. Forget sacks and turnovers. You won't lose many games holding your opposition to those kinds of numbers. But according to Pederson, there's only one number that really matters. "That we have one more point than them at the end of the game," he said with a laugh. "You know, I don't -- and I think [defensive coordinator Jim] Schwartz is the same way -- I don't put a lot of emphasis on points, yards or this and that. "If we just go out and execute the game plan and do our jobs -- which we've kind of said all along -- those kinds of things kind of take care of themselves." Against the Falcons, that was certainly the case.